Feature Product: Rollershield Air/Water Barrier from Master Wall Inc.
Rollershield is a high quality 100% acrylic roll applied flexible air and water barrier. Easily applied with a trowel, brush, roller, hopper gun or airless sprayer. Rollershield forms a continuous air and water barrier that protects approved substrates from incidental water damage. Exposure: 30 days maximum for EIFS*, 6 months maximum for other claddings. Job Conditions – Air and substrate temperature for application of Rollershield must be 40°F (5°C) or higher and must remain 40°F (5°C) or higher for a minimum of 24 hours. Provide temporary protection to protect the wall system from damage until permanent flashings, caps and sealants are installed. Store materials within prescribed temperature limits and out of direct sunlight. Working and drying times are based upon normal room temperature conditions and will vary with temperature and humidity. Preparation – The substrate must be approved by Master Wall Inc., clean, dry, structurally sound and free of efflorescence, oil, grease, form release agents and curing compounds or anything that would affect bond. Painted surfaces are not acceptable and must be removed. Substrates must be flat and free of fins or planar irregularities greater than 1/4″ in 10′-0″ (6.35 mm in 3.05m). Concrete – Must have cured a minimum of 28 days prior to the application of Rollershield. If form release agents or curing compounds exist on the surface, they must be removed with a solution of muriatic acid or similar product (with appropriate precautions). Remove any residual acid by flushing with water. Brick/Masonry – If joints are not struck flush, multiple coats may be required. Contact Master Wall for more information. Sheathing Applications – Sheathing gaps must be less than 1/4″ (6.4 mm). For gaps larger than 1/4″ (6.4 mm) WeatherStop Tape or Rollershield Flashing Tape may be used. Gap wood-based sheathing per manufacturers recommendations, typically 1/8″ (3.2 mm) minimum. Mixing – Thoroughly stir Rollershield into a homogenous consistency. Do not add water, over mix, or add accelerators or retarders to Rollershield. Application – Rollershield is applied by first treating the joints and fastener locations where sheathing is used, then coating the entire surface using brush, roller, trowel or airless spray equipment techniques. When using a foam roller, a maximum ¾” (19 mm) nap is recommended. Apply Rollershield in an even, continuous coat, maintaining a wet edge of approximately 15 mils thickness. 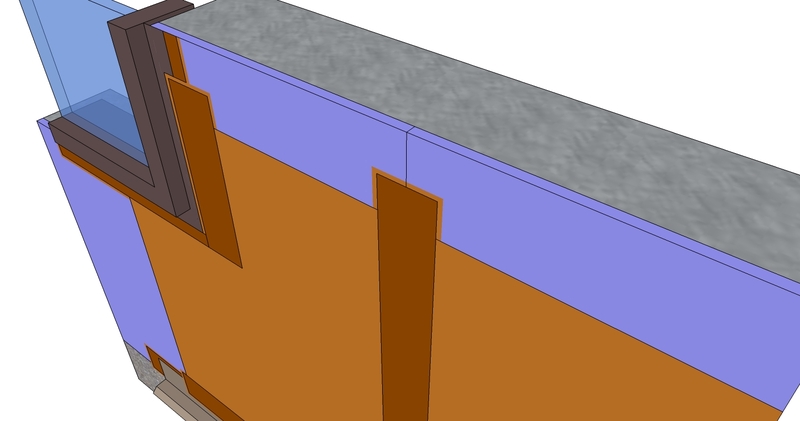 Oriented Strand Board and other porous substrates require two (2) coats of Rollershield. For moisture protection, Rollershield must be applied as a continuous barrier of 10 mils dry thickness with no breaks or skips, although some areas will appear lighter than others due to the application process. The Rollershield application need not look like a painted surface. Joint Treatment—Apply a thin layer of Rollershield to the joints and embed Rollershield Flashing Tape into the wet mixture and trowel smooth. Alternatively place and center Rollershield Mesh over all joints, corners and gaps in the substrate. Immediately embed Rollershield into the reinforcing mesh and spot fasteners using a paint brush or trowel and allow to dry. 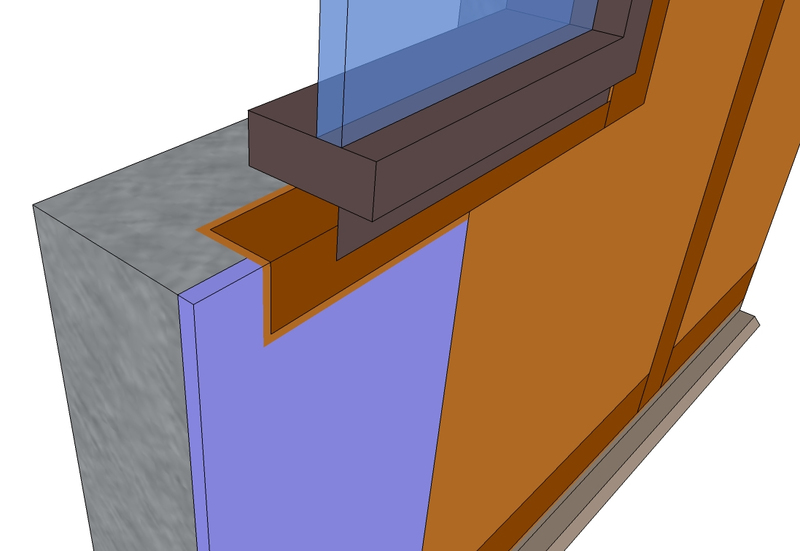 Rollershield may be flashed into window, door and other openings using the same techniques for sheathing applications. Any remaining gaps should be filled with Master Wall Trowelshield or Trowelshield and Mesh may be used as the joint treatment. Wall Treatment—Apply Rollershield to the wall surface using the foam roller, trowel or by spray applying and backrolling to a uniform thickness of 10 mils with no pinholes or voids. Clean Up-Tools and equipment can be cleaned with soapy water when Rollershield is wet. Limitations – Not for use as an exterior finish. • Minimum 1 gallon per minute output. • Minimum hose width of 3/8 inch. • Minimum tip size of 0.027–0.031. Minimum pressure requirement to spray of 2,000 psi at the gun with an airless sprayer rated no lower than 3,300 psi. Remove all filters in sprayer and gun before application. Hopper Gun: 3/16″-1/4″ (6-6.5 mm) orifice, 23-25 psi. Information contained in this product data sheet conforms to the standard detail recommendations and specifications for the installation of Master Wall® Inc. products and is presented in good faith. Master Wall® Inc. and Kodiak Mountain Stone assumes no liability, expressed or implied as to the architecture, engineering, or workmanship of any project. This information may be concurrent with, or superseded by other applicable documents, such as specifications and details. Contact Master Wall® Inc. for the most current product information. This information has been obtained from the Master Wall website http://masterwall.com/prod-rollershield.html. For questions and/or information regarding Rollershield please contact one of our sales representatives at Kodiak Mountain Stone or contact Master Wall Inc.
1. We care that our customers find the right product for their project. We have a strong product with many different profiles and colors to match any project. We have excellent staff in our stores and plant that can help our customers find the right style and color to match their project. We care that our customers are happy with the product and feel they received value for their dollars spent. We have been making our own manufactured stone veneer for almost ten years and have perfected the process. Our plant staff have streamlined the process to ensure a quality product. Our Plant Operations Manager enjoys experimenting with new colors so we can provide our customers with a great variety of choices. We know how awesome your project looks with our product on it! 2. Kodiak Mountain Stone is passionate about education within and without our company on multiple levels. First, when we have an employee who is going to school we will adjust their work schedule to accommodate their school schedule. Second, each employee is given 30 minutes each day to read and learn more about our products, industry and other self-improvement books. Thirdly, we have gone a step further and in conjunction with several high schools (Victoria Park and the Holy Spirit School Division in Lethbridge, Alberta), we have provided information sessions to their students on the ‘rock’ business, how to install our products, and the masonry vocation. Knowledge is power and if we can help others improve themselves, isn’t that what life is all about. 3. We have two retail outlet stores with incredible displays of products, the Lethbridge Store (2620 2 Ave N) and the Calgary Store (5432 56 Ave SE). Our little secret is that in our Lethbridge store we have Jeff “Red” Redford who has been with us almost since the beginning. He started work as a demolder, taking stone out of the molds at our very first plant in Cardston. He went on to work in our Lethbridge warehouse organizing inventory and getting orders out to customers. Now he works full time in our Lethbridge store and shares his knowledge with each customer that comes in. He is our own little secret weapon. If other staff have a question, we call him. He not only works in the store he also is our Operations Manager, managing all our Canada inventory and logistics. 4. We have a great website which we are continuously updating and improving. http://kodiakmountain.com/ . You can find a list of locations to buy our products. We offer our own Kodiak Mountain Stone line of artificial stone, several other manufactured stone product lines, Natural Stone from quarries all across CAN and USA, Brick, Acrylic Stucco, Light Weight Concrete Fencing and other support products you will need to help you do the install. You can find an Installation Guide too so you can DIY, http://kodiakmountain.com/installation-guide/. Don’t forget that knowledge is power. 5. We have a huge gallery of pictures on our website to show examples of how prestigious your project can look like when finished. We have organized the gallery by product to make it easier to find what you want. We encourage our customers to provide us a picture of their project to show off their glamorous project whether it be the exterior of their house, their fence, a fireplace inside or out, a feature wall or adding a bit of stone around their Jacuzzi to spruce it up. You will also see a link to our Client Galleries and see what specific projects that masons and home builders have done. This might help you decide who to talk to for your project. 6. You don’t have to come into our various locations to buy our stone. You can live anywhere in the world and buy our stone. We have shipped our stone all across Canada, USA and even as far away as Guam. We encourage our customers to see the actual stone before buying as the colors on the picture can vary depending on how you are viewing them. We will discuss with you a way to send you samples of the stone you are interested in. Putting up a stone feature wall in your home is great for adding a modern elegant look to a main room. Adding manufactured stone or natural stone to the interior of your house is going to add and create value to the finished product of your home. Given most people choose to do tile or leave it plain, why not try a stone finish. It’s the area you probably spend the most time in, so why not create that beautiful texture and difference between your home and everyone else’s. The availability of colors is open to suite any of your personal tastes and ability to match your current cabinetry and finishes now. To finish off that renovation you thought you completed, but it’s just missing that one thing to really make it stand out. Creating that ambiance when you walk in, having a beautiful stone wall, that gives you that benefit of looking around and instantly feeling relaxed after a long day. Soak in your bathtub and just enjoy your finished bathroom in style. Given the amount of accessories Kodiak Mountain Stone carries, we have everything you need to finish this project and make it perfect and to match your vision. Take your tired and worn down looking fireplace and create something that POPS and makes it come to life again. It will be something beautiful to look at for years to come. Add a twist to the usual look in your master suite; Add stone to a wall to give it a more personalized approach to the space. This seems to be the most common approach when it comes to using stone and it is the most modern finish to any home. Given the textures and profiles of stone Kodiak Mountain Stone has to offer, you can really make this your special project. Adding your TV to this specialty wall or just leaving it on its own, will really draw the eye to this area. These are just a few of the benefits of using Kodiak Mountain Stone to Improve your Home. 1. Aesthetics: When renovating the the exterior or interior of any home, manufactured stone brings a pleasing sight to the eye, just search Picasa or Flickr for us and you can see that adding stone to your house can catch anyone’s eye and impress the best of them. 2. Value: Kodiak Mountain strives to provide the best quality manufactured stone for the best value. 3. Installation: When it comes to making home improvements for the sake of bettering the value. Our products are a DIY-ers DREAM! Super easy to install yourself and a ton of videos and photos via our website on how to. Bottom line: No labor costs means more money IN YOUR POCKET. 4. Durability: We have went so far as to submit our products to Specialized Testing for precast stone veneer qualification testing. What does that mean? Our products meet or exceed the code for veneered stone products in North America. In comparison to competitors we also offer a 50 year warranty! You just cant beat that! With a vast selection of available manufactured stone, What makes Kodiak Mountain Stone different? What makes us stand out from the rest of the stone suppliers? We are the one stop shop, we carry manufactured stone, natural stone, brick, acrylic stucco and the various other supplies needed to to the job, eg mortar, lath, trowels, mason blades, etc.! Kodiak Mountain Stone is all about, finishing your dreams. As a team we WANT your project to be the most positive and exciting experience, whether building your new home or renovating your current space. No project is too big or too small, we are willing to work with you to make your vision come to life. Customer service is a key part of our company; from emails, phone calls, to just walking in our door to check out our amazing showrooms. We are proud of what we have to offer YOU and we are always available to answer any questions or inquiries about our products. We will work alongside you, to determine the quantity you need, profile and color. We also offer sample boards to take home to test colour matching and profile with your current decor, or just to confirm you have chosen the correct stone for your project. We can quickly put together a quote so you have idea of the cost. With our manufactured stone, we are the manufacturer and able to introduce lower price points. Our natural stone is quarried from various locations across North America, offering you a beautiful selection to choose from. We offer Cherokee Brick & General Shale brick, full or veneered. We also carry exclusive specialized tumbled brick. Masterwall is our stucco supplier of choice, with the quality and variations between textures and colors, we can make any of your color swatches a reality at our stores. We also carry mortar and lath in our stores, as a convenience item for our customers to get their projects started ASAP! We really believe in our product and we back it up, with a 50 year guarantee and we have been engineer tested! Kodiak Mountain Stone, Offers Elegance/Authenticity/Quality/Durability & Affordability! Kodiak Mountain Stone is excited to introduce our new line of natural stone from Natural Stone Veneers International (NSVI)! Natural Stone Veneers International fabricates natural thin veneer stone for interior and exterior building applications. NSVI has emerged as the leader in the natural stone industry with its diverse natural thin veneer stone products and are excited to be teamed up with Kodiak Mountain Stone. Stop by one of our stores in Lethbridge or Calgary AB to find out more and to see some of their great samples!